After not playing in Monroe since Dec. 30, the women’s basketball team returned home to start a two game stretch of Georgia based teams. Georgia Southern was the first to step into Fant-Ewing on Thursday to take on the Warhawks. ULM was able to defeat the Eagles 58-57. Despite a slow start, ULM was able to jump ahead in the first quarter 14-11. However, the Eagles of Georgia Southern allowed the Warhawks to only score eight points in the second quarter. Georgia Southern led at halftime 27-22. In the first half, ULM went 9-for-30 (30 percent) on field goals and 4-for-15 (26.8 percent) on three-pointers. Hoping to not let the game run away from them, ULM came out swinging in the second half, keeping up with a physical Georgia Southern team. Both teams scored 18 points a piece with Georgia Southern leading 45-40. A tough fourth quarter battle was on the horizon for both squads. The fourth quarter saw exciting, back-and-forth play from both ULM and Georgia Southern. With less than five seconds left in the game, Georgia Southern led ULM 57-56. After a video review, ULM got the ball back. 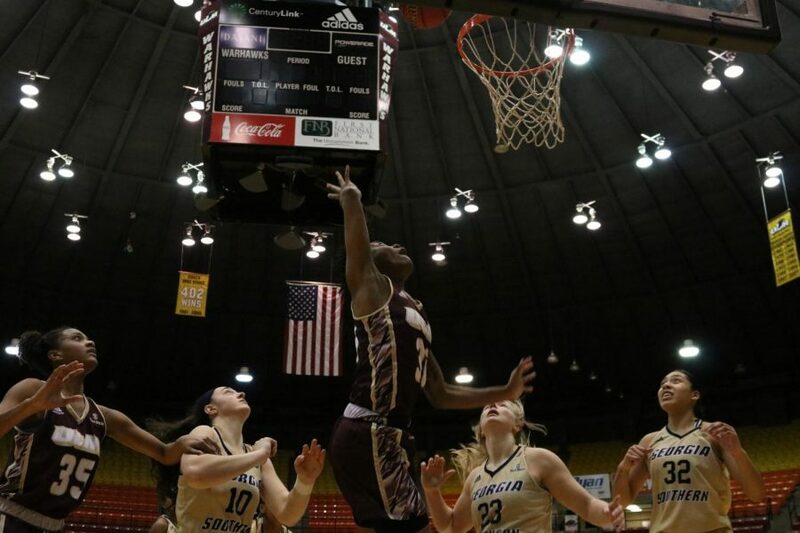 Sophomore guard Arsula Clark received the ball and hit the game-winning layup to win the game for the Warhawks. “We did just enough to keep it close and to give ourselves a chance,” head coach, Jeff Dow said. ULM ended the night going 24-for-63 (38.1 percent) on field goals and 8-for-26 (30.8 percent) on three-pointers. The Warhawks scored 24 points in the paint and the bench also rose to the occasion, scoring 26 points. Redshirt freshman guard Tiara Malone led the Warhawks with 24 points, going 9-for-15 on field goals and 6-for-10 on three-pointers. Junior guard Amber Thompson finished the night with 12 points, going 5-for-9 on field goals. Clark ended the night with six offensive rebounds and freshman forward Jamie Means came up big defensively, grabbing five defensive rebounds. Georgia State was next up for the Warhawks on Saturday. The Panthers were 7-7 on the season coming into the game and looking to grab a winning record. Clark started the game hot, grabbing 10 points in the first quarter. However, it wasn’t enough as the quick Georgia State team never let up and won the game 56-41. ULM is now 7-8 on the season and 1-3 in conference play. The Warhawks will travel to Lafayette on Jan. 19 to take on rival ULL.